The E85 Minimal Tail Swing weighs 8.5 tons, is 91 inches wide, and has a dig depth of 15 feet, 6 inches. The 59.4 horsepower diesel engine is Tier 4 compliant and features a high-pressure common-rail fuel injection system, diesel oxidation catalyst, and a diesel particulate filter. A tail overhang of 5.8 inches allows for work in compact environments. The blade float feature gives operators the ability to smoothly grade, level or backfill material. 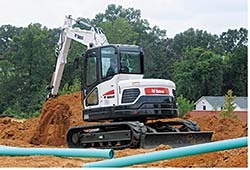 The excavator comes with auto-shift travel, which shifts the unit out of high range or low range and back automatically.